May not be a definitive adaptation, but it sure makes up for 'The Dark Tower' functioning more like the film we should have gotten two years ago. Made for stephen King/Dark Tower fans, and horror fans alike. Two years ago, I let a Stephen King film get the better of me. While I didn’t find The Dark Tower anywhere near abysmal as others, it was not the film we deserved. Since then, studios and directors have taken King’s books seriously and decided to start making his films not just good, but surprisingly great. And with Pet Sematary celebrating its 30th anniversary, it was time for someone to dig it up and breathe some new life into one of King’s most terrifying stories. Dr. Louis Creed (Jason Clarke) has uprooted his family from Boston to Ludlow, Maine hoping to start a new adventure. His wife Rachel (Amy Seimetz), daughter Ellie (Jete Laurence), and son Gage (Hugo and Lucas Lavoie), are along for the ride. One day, Ellie and Rachel discover the local pet sematary — Ellie points out it’s spelled wrong — located on their land, but neighbor Jud (John Lithgow) shows Louis the real cemetery deeper in the woods. A mistake that comes back to haunt everyone after Louis buries the family cat, Church, which comes back with some evil spirits in tow. The cast shows how far horror acting has come in the last three decades. And hopefully this is a nice sizzle reel directors Kevin Kolsch and Dennis Widmyer can use to get onboard the Dark Tower Amazon Prime show. They clearly have a love for the series and all things King. 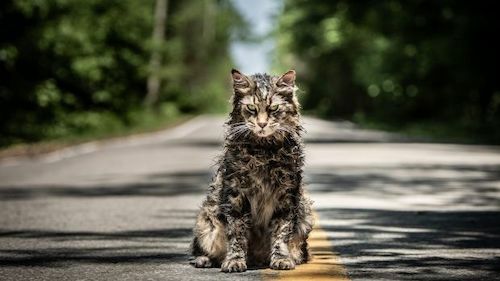 While it may not be quite the best remake, Pet Sematary works spectacularly as the Dark Tower film we wish Sony could have delivered. The directors, and writer Jeff Buhler, fill the film with King connections and litter it with enough Dark Tower references to make fans heads spin. It really keeps the film afloat from start to finish, and the highly marketed new twist leaves the door open to the best ending of the story yet. This may not be the definitive film version, but it’s a fantastic update for modern audiences.